I was unsure what to expect when we decided to visit the brand new aquarium that opened up close to us, the Portland Aquarium. I had heard mixed reviews from friends but we decided to go for Zarek’s birthday and see what it was like. After spending a couple hours there we were in love! I went in not as a blogger but as a mom, but after my experience I wanted to share how awesome it was. At the end of our visit I asked to speak to a manager so I could find out more about the aquarium and answer some questions I had heard other mom’s ask. In the end I got some extra special treatment, but that did not affect my opinion in any way about this great educational, interactive environment. Small Space Used to its Fullest! I had heard that the aquarium was small and crowded from many moms on Facebook. I would say it is between the size of the Seaside Aquarium and Oregon Aquarium in Newport. But I was actually impressed how they planned out the space using every corner including the play structure at the end, which the boys loved getting their energy out in. They made up for size with how interactive and educational they made every room! Most of the rooms had touch tanks, where you could feed and interact with the fish. 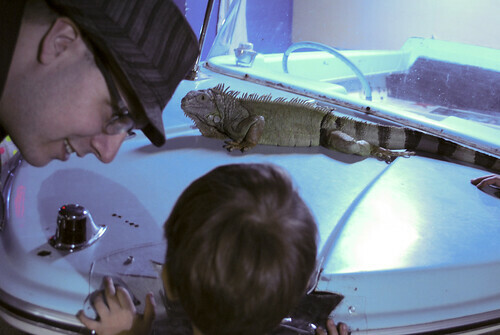 Staff were available in most of the rooms to answer questions and to share about the different animals with the kids. Even TJ and I learned so much from our visit. Zane can actually tell you a lot about each of the animals. 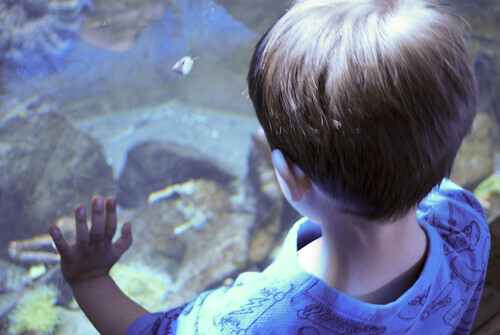 Something we have never gotten from other visits to the aquarium or zoo. I was actually surprised to find out the day we went they were low on staff due to multiple people calling in sick. There was at least one staff member in every room and close by in the hands on areas. The boys and I also got to see the staff doing the food prep for the animals and working in the “hospital area”. I found out that a lot of the staff members were marine biologists or were currently in school for marine biology. 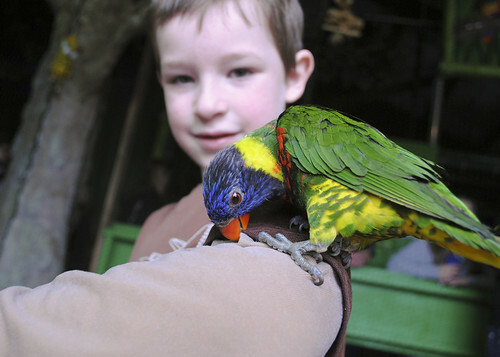 Which made a lot of sense when you interacted with each staff member, they were very knowledgeable about the animals. They also had a passion about the animals, showing how much they cared about each one. Vets also come in at least three times a week to check up on the animals and care for their needs. The animals were so bright, happy and active. Made me realize just how lethargic and stressed some of the animals I’ve seen in other places are. I loved seeing the manager talk about how they were aware and concerned for Roxy, the octopus. She was stressed, shown by changing to a white color, though I saw Rosy earlier bright red showing off her happiness. I also enjoyed seeing all their notes behind the scenes talking about each animals schedule, sharing what they were working on for training, and “make sure they get to play”. Even the food has special attention so it is the best it can be for the animals. Can you believe that the food they feed their animals is sushi grade. So even you could eat it, but that is highly not recommended. The staff even takes special care in preparing it for highest nutrition. Did you know if they thawed it under warm water it would lose some of its nutrients? Oh and if you were wondering the towels to dry your hands are changed out twice a day, every staff member takes a turn at this chore. They use towels because they have found that no matter how hard they try paper towels would end up in the tank. I think if you are really concerned about germs bring in your own little towel or just let your hands air dry between the rooms. Please make sure and not use hand sanitizer in the aquarium as the chemicals will get into the tanks and can be harmful for the animals. The wash stations are set up with special soap that will not add any harmful chemicals to the tanks. The aquarium is also trying to get another wash station in the last room. They are working with a plumber to get it in right now. I personally found not very many people were really using the wash stations or the towels. Your hands will dry fast enough on their own. I loved how you could see the work being done to build the puffins habitat! I’m excited to go back when they add the puffin and otter exhibit! Do you have a local aquarium? I haven’t been to the Portland aquarium yet. Sometime we need to find the time to go. It sounds like you had a great time and I enjoyed reading your post about it. The octopus’s name is actually Roxy. But that’s neither here nor there. It’s a great place for kids and families and I’m so happy to read a positive article, they get such a bad rap! I have taken my Grandkids there several times. They LOVE it! My family and I have been there once. It was nice and my 4 year old enjoyed it as well. The problem I have is that the owner/management has a history of poaching the animals from their natural environment without any consent from the authorities. I found out this after our visit. I don’t know about you, but I refuse to support a business that acquired the animals unethically. If we do, what are we teaching our children? Animals are not here for us to treat them as a commodity or for our amusement/entertainment. I don’t know where you get your information about the poaching, but I am happy to say you were fed misinformation. The FORMER co-owner and operator of the IDAHO (not Portland) aquarium is currently being prosecuted for obtaining animals while the proper permits were still in the process of being obtained. Animals were never poached for the Portland aquarium. Please do not spread false information that has the potential to harm a company that is making huge strides towards conservation and animal protection. Thanks for this great reply Marine Kat – very helpful. And the Portland Aquarium is very upfront with this information, which shows they respect the laws and are not hiding anything. Just as Marine Kat mentioned that is was a former investor that was having legal trouble. Actually the manager was very upfront about letting me know about this, even though I knew nothing about it. It was that the co-owner had an animal that he was still waiting for the permit to make it all the way through the process and had the animal. All the animals at the Portland Aquarium are permitted and legal. I am a big fan of aquariums. In fact I wrote about the GA aquarium in the past…. it is a seriously impressive one…. Sounds like a great time! We do have a local aquarium but I don’t think it stacks up to those actually on or nearer the coast. I love aquariums. Growing up before we lived in Baltimore, MD we would always go to visit my grandparents & the aquarium there was always a must stop place. I loved it, especially the dolphin show. I’d actually like to visit Portland this year so we’ll have to put a stop here on the list!